Not all athletic shoes are created equal. 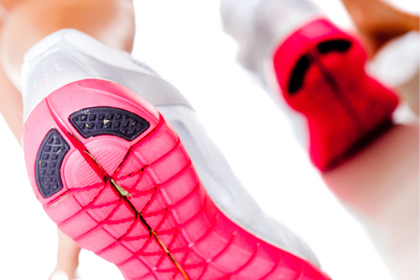 Home/Fitness, Healthy Living, Uncategorized/Not all athletic shoes are created equal. Is it time for new work-out shoes? Head’s up.. When is the last time you had a good look at your athletic shoes? Has it been recent enough that you remember the store you bought them from? As a general rule, you want to replace your shoes about every 500 miles of use, sooner if you are heavy on your feet. 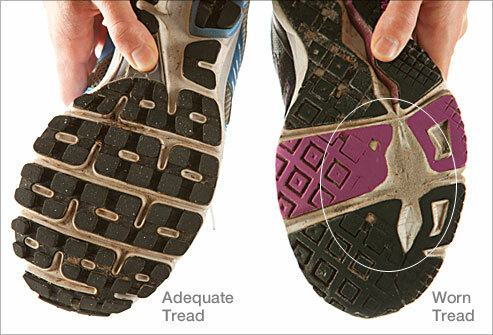 Check the sides of your shoes for compression lines, or the bottom for worn out tread. These are both signs that retiring your shoes is long over-due. So how often should you replace your shoes? If you exercise/run 2 times per week, you’d want to replace your shoes at least once each year. If you exercise/run 3 times per week, replace your shoes about every 8 months. If you exercise/run 4-5 days per week, replace your shoes at least every 6 months. If you exercise/run 6-7 days per week, replace your shoes at least every 4 months. *Note that these are averages, check your shoes for wear and tear (as mentioned above), as they may need to be replaced sooner. Despite the numerous amount of websites and shoe stores around the country full of information, most people buy shoes for style instead of functionality..and consequently buy the wrong shoes. Athletic shoes are grouped into categories. They are Walking, Training, and Running. Walking shoes have soles that are designed to facilitate the natural roll of the foot (front to back) during the walking motion, and aid in shock absorption. They also usually have a smoother tread. Running shoes are also designed for front to back motion, and are often light weight. They have great cushioning and flexibility, but do not sacrifice control and stability in the heel counter area. They also have great traction. Walking/Running shoes are not safe, or ideal, for any physical activities that require side-to-side movements. For these activities, you want some type of a Training shoe. Training shoes are broken down into several categories including cross-training shoes, and specialty shoes such as football cleats, basketball shoes, golf shoes, dance shoes, etc. If you are able to, purchase your athletic shoes from a specialty store. They will have more selection, and staff that will be able to provide valuable input and aid with proper fitting. Keep in mind that when trying on new shoes, you should be able to wiggle your toes freely. Also, your heel should fit securely in the shoe; it shouldn’t slip if you walk or run. If you have foot problems (watch how/where your shoes wear down on the bottom), you may need special inserts such as arch supports. When in doubt on which shoes to buy, ASK, ASK, ASK!! A little research never hurts, either. ? By mlbulgin1|2015-11-02T12:46:55-05:00November 2nd, 2015|Fitness, Healthy Living, Uncategorized|Comments Off on Not all athletic shoes are created equal.